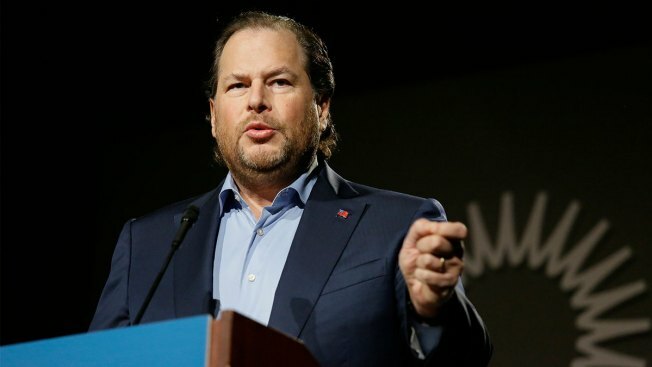 In this photo taken Tuesday, Oct. 30, 2018, Salesforce CEO Marc Benioff speaks at a SPUR luncheon in San Francisco. In public, including on Twitter, Salesforce boasted about fighting human trafficking using its data tools. But behind closed doors, Salesforce’s data tools were actually providing the backbone of Backpage’s exponential growth. Salesforce didn’t just provide Backpage with a customer-ready version of its data and marketing tools. Salesforce designed and implemented a heavily customized enterprise database tailored for Backpage’s operations, both locally and internationally. With Salesforce’s guidance, Backpage was able to use Salesforce’s tools to market to new “users” — that is, pimps, johns, and traffickers — on three continents.